Summer 2001 has seen a string of Japanese soccer players transfer to top overseas clubs. In the run up to the 2002 FIFA World Cup--to be hosted jointly by Japan and South Korea--six candidates for Japan's World Cup squad will play the coming season abroad, all of them in their early twenties. Although some of the world's top players have played in Japan--including Brazilian World Cup winners Zico and Dunga--never before have so many Japanese stars plied their trade overseas at the same time. Fans in Japan have great expectations for what they can achieve playing alongside some of the biggest soccer stars in the world. Four of the six Japanese stars will play in Europe. Having contributed to AS Roma's winning the Italian league championship last season, Japan's ace midfielder Hidetoshi Nakata--who has already proved himself in Italy--was transferred to another Italian team, Parma. Unable to hold down a regular starting place due to competition for the position of playmaker during his time at Roma, Nakata's place in Parma's starting line-up is assured. He looks set to make a full contribution as the driving force behind Parma's bid for honors this season. Three other Japanese players have followed Nakata to Europe. 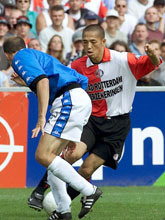 Pass master Shinji Ono, whose ability is highly rated by many observers around the world, signed for one of the Netherlands' top clubs, Feyenoord. Taking over the number 14 shirt worn in the 1970s by the legendary Dutch star Johann Cruyff, the team expects much of its new import. In his first game with his new club on August 19, Ono played a part in two of the team's goals. Defensive midfielder Jun'ichi Inamoto, meanwhile, moved to England--the home of soccer--to join one of the top teams in the Premier League, London-based Arsenal. The team's manager, Arsene Wenger, used to coach Nagoya Grampus Eight of the J. League and is therefore familiar with the ability of Japanese players. Inamoto has great balance and the ability to make accurate long passes. Before leaving for England he commented: "I want to see whether what I have learned in Japan will translate into success abroad and find out which things I need to do better. I want to grow both as a footballer and as a person." Also heading to England is striker Akinori Nishizawa, who has a natural ability to score goals and played the second half of last season in the Spanish league. He has joined Bolton Wanderers, a team that has just been promoted to the Premier League. Meanwhile, Naohiro Takahara--a striker on whom much of Japan's footballing future depends--moved to South America, a continent every bit as soccer mad as Europe, by signing for Boca Juniors of Argentina. Boca's former players include the great Diego Maradona, and this year the team won the Libertadores Cup to become South American club champion for the second year running. Takahara has an excellent build for a footballer, scores a lot of goals, and never gives up. Although Takahara wil be the first Japanese ever to play in Argentina, compatriot Nozomi Hiroyama already plays in South America. Hiroyama has been playing for Cerro Porteno in the Paraguayan league since February 2001. Fleet-footed and a skillful dribbler, Hiroyama answers post-match interviews in fluent Spanish and seems to have quickly settled into life in Paraguay. Just like the exodus of Japanese baseball players to the American Major League, some people complain that the transfers of talented young soccer players to foreign leagues will make the J. League hollow. However, the manager of the Japanese national team Philippe Troussier actively encourages players to transfer abroad. He is convinced that Japanese soccer will improve precisely through honing their skills in soccer-playing countries. Saburo Kawabuchi, chairman of the J. League, is also firmly in favor of young players gaining experience overseas, believing that it will help the wider development of soccer in Japan. Nowadays fans can watch overseas soccer on Japanese TV. The foreign leagues where Japanese stars will play each start their new seasons in August. With most of the games taking place late at night Japanese time, many fans could be in for some very late nights as they follow the exploits of Japan's latest exports. Copyright (c) 2001 Japan Information Network. Edited by Japan Echo Inc. based on domestic Japanese news sources. Articles presented here are offered for reference purposes and do not necessarily represent the policy or views of the Japanese Government.